A cousin of the meatball (), the meatloaf is a traditional German dish. The recipe below is for a meal that feeds 4-8 people. The ground beef used has little fat, and thus a relatively low omega-6 content. Most of the fat comes from the 1 lb of ground grass-fed lamb in the recipe, which has a higher omega-3 to omega-6 ratio than the regular (i.e., non-grass-fed) ground beef. 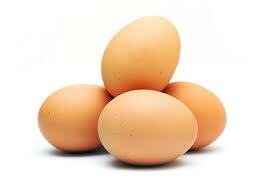 The egg acts as a binder. Leave the potato out if you want to decrease the carbohydrate content; it does not add much (nutrient numbers are provided at the end of the post). - Prepare some dry seasoning powder by mixing salt, parsley flakes, garlic powder, chili powder, and a small amount of cayenne pepper. - Grate one zucchini squash and one peeled potato. Cut half an onion into small pieces of similar size. - Mix 2 lb of very lean ground beef (96/4) with 1 lb of ground grass-fed lamb. - Add the dry seasoning, zucchini, potato, onion and a whole egg to the ground meat mix. - Place the mix into a buttered casserole dish with the shape of a loaf. - Preheat the oven to 375 degrees Fahrenheit. - Bake the meatloaf for about 1 hour and a half. It is a good idea to place the casserole dish within a tray, as in the photo above. The meatloaf will give off some of its juices as it bakes, which may overflow from the casserole dish and make a mess in your oven. Below is a slice of meatloaf served with a side of vegetables. The green spots in the meatloaf are the baked zucchini squash pieces. A thick slice like the one on the photo above will have about 52 g of protein, 15 g of fat, and 6 g of carbohydrates (mostly from the potato). That'll be about 1/5 of the whole meatloaf; the slice will weigh a little less then 1/2 lb (approximately 200 g). The fat will be primairly saturated and monounsaturated (both healthy), with a good balance of omega-3 and omega-6 fats. 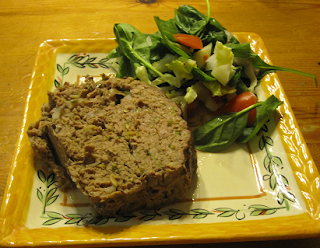 The slice of meatloaf will also be a good source of vitamins B12 and B6, niacin, zinc, selenium, and phosphorus. The idea that protein powders should be consumed prior to weight training has been around for a while, and is very popular among bodybuilders. Something like 10 grams or so of branched-chain amino acids (BCAAs) is frequently recommended. More recently, with the increase in popularity of intermittent fasting, it has been strongly recommended prior to “fasted weight training”. The quotation marks here are because, obviously, if you are consuming anything that contains calories prior to weight training, the weight training is NOT being done in a fasted state. Most of the evidence available suggests that intermittent fasting is generally healthy. In fact, being able to fast for 16 hours or more, particularly without craving sweet foods, is actually a sign of a healthy glucose metabolism; which may complicate a cause-and-effect analysis between intermittent fasting and general health. The opposite, craving sweet foods every few hours, is generally a bad sign. One key aspect of intermittent fasting that needs to be highlighted is that it is also arguably a form of liberation (). Now, doing weight training in the fasted state may or may not lead to muscle loss. It probably doesn’t, even after a 24-hour fast, for those who fast and replenish their glycogen stores on a regular basis (). However, weight training in a fasted state frequently induces an exaggerated epinephrine-norepinephrine (i.e., adrenaline-noradrenaline) response, likely due to depletion of liver glycogen beyond a certain threshold (the threshold varies for different people). The same is true for prolonged or particularly intense weight training sessions, even if they are not done in the fasted state. The body wants to crank up consumption of fat and ketones, so that liver glycogen is spared to ensure that it can provide the brain with its glucose needs. Exaggerated epinephrine-norepinephrine responses tend to cause a few sensations that are not very pleasant. One of the first noticeable ones is orthostatic hypotension; i.e., feeling dizzy when going from a sitting to a standing position. Other related feelings are light-headedness, and a “pins and needles” sensation in the limbs (typically the arms and hands). Many believe that they are having a heart attack whey they have this “pins and needles” sensation, which can progress to a stage that makes it impossible to continue exercising. Breaking the fast prior to weight training with dietary fat or carbohydrates is problematic, because those nutrients tend to blunt the dramatic rise in growth hormone that is typically experienced in response to weight training (). This is not good because the growth hormone response is probably one of the main reasons why weight training can be so healthy (). Dietary protein, however, does not seem to significantly blunt the growth hormone response to weight training; even though it doesn't seem to increase it either (). Dietary protein seems to also suppress the exaggerated epinephrine-norepinephrine response to fasted weight training. And, on top of all that, it appears to suppress muscle loss, which may well be due to a moderate increase in circulating insulin (). So everything points at the possibility that the ingestion of some protein, without carbohydrates or fat, is a good idea prior to fasted weight training. Not too much protein though, because insulin beyond a certain threshold is also likely to suppress the growth hormone response. Does the protein have to be in the form of a protein powder? No. Supplements are made from food, and this is true of protein powders as well. If you hard-boil a couple of large eggs, and eat only the whites prior to weight training, you will be getting about 8-10 grams of one of the highest quality protein "supplements" you can possibly get. Included are BCAAs. You will get a few extra nutrients with that too, but virtually no fat or carbohydrates. In order to achieve muscle gain, one has to repeatedly hit the “supercompensation” window, which is a fleeting period of time occurring at some point in the muscle recovery phase after an intense anaerobic exercise session. The figure below, from Vladimir Zatsiorsky’s and William Kraemer’s outstanding book Science and Practice of Strength Training () provides an illustration of the supercompensation idea. Supercompensation is covered in more detail in a previous post (). Trying to hit the supercompensation window is a common denominator among HealthCorrelator for Excel (HCE) users who employ the software () to maximize muscle gain. (That is, among those who know and subscribe to the theory of supercompensation.) This post outlines what I believe is a good way of doing that while avoiding some pitfalls. The data used in the example that follows has been created by me, and is based on a real case. I disguised the data, simplified it, added error etc. to make the underlying method relatively easy to understand, and so that the data cannot be traced back to its “real case” user (for privacy). 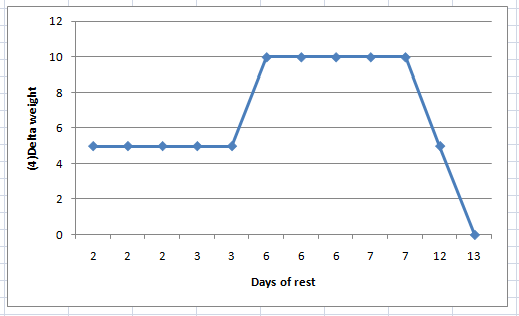 - Number of rest days in between exercise sessions (“Days of rest”). - The amount of weight he used in each deadlift session (“Deadlift weight”). - The amount of weight he was able to add to the bar each session (“Delta weight”). - The number of deadlift sets and reps (“Deadlift sets” and “Deadlift reps”, respectively). 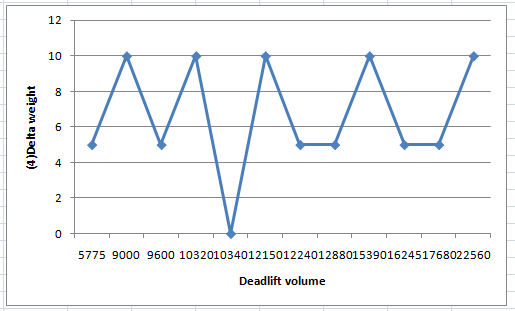 - The total exercise volume in each session (“Deadlift volume”). This was calculated as follows: “Deadlift weight” x “Deadlift sets” x “Deadlift reps”. John’s ability to increase the weight with which he conducted the deadlift in each session is measured as “Delta weight”. That was his main variable of interest. This may not look like an ideal choice at first glance, as arguably “Deadlift volume” is a better measure of total effort and thus actual muscle gain. The reality is that this does not matter much in his case, because: John had long rest periods within sets, of around 5 minutes; and he made sure to increase the weight in each successive session as soon as he felt he could, and by as much as he could, thus never doing more than 24 reps. If you think that the number of reps employed by John is too high, take a look at a post in which I talk about Doug Miller and his ideas on weight training (). 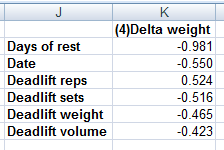 Below are three figures, with outputs from HCE: a table showing the coefficients of association between “Delta weight” and the other variables, and two graphs showing the variation of “Delta weight” against “Deadlift volume” and “Days of rest”. As you can see, nothing seems to be influencing “Delta weight” strongly enough to reach the 0.6 level that I recommend as the threshold for a “real effect” to be used in HCE analyses. There are two possibilities here: it is what it looks it is, that is, none of the variables influence “Delta weight”; or there are effects, but they do not show up in the associations table (as associations equal to or greater than 0.6) because of nonlinearity. 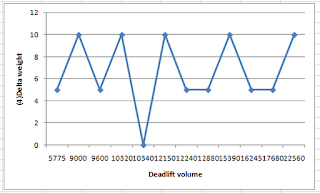 The graph of “Delta weight” against “Deadlift volume” is all over the place, suggesting a lack of association. This is true for the other variables as well, except “Days of rest”; the last graph above. That graph, of “Delta weight” against “Days of rest”, suggests the existence of a nonlinear association with the shape of an inverted J curve. This type of association is fairly common. In this case, it seems that “Delta weight” is maximized in the 6-7 range of “Days of rest”. Still, even varying things almost randomly, John achieved a solid gain over the time period. That was a 33 percent gain from the baseline “Deadlift weight”, a gain calculated as: (285-215)/215. HCE, unlike WarpPLS (), does not take nonlinear relationships into consideration in the estimation of coefficients of association. In order to discover nonlinear associations, users have to inspect the graphs generated by HCE, as John did. 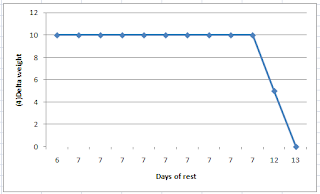 Based on his inspection, John decided to changes things a bit, now working out on the right side of the J curve, with 6 or more “Days of rest”. That was difficult for John at first, as he was addicted to exercising at a much higher frequency; but after a while he became a “minimalist”, even trying very long rest periods. Below are four figures. The first is a table summarizing the data John obtained for his second trial. The other three are outputs from HCE, analogous to those obtained in the first trial: a table showing the coefficients of association between “Delta weight” and the other variables, two graphs (side-by-side) showing “Delta weight” against “Deadlift sets” and “Deadlift reps”, and one graph of “Delta weight” against “Days of rest”. As you can see, “Days of rest” now influences “Delta weight” very strongly. The corresponding association is a very high -0.981! The negative sign means that “Delta weight” decreases as “Days of rest” increase. 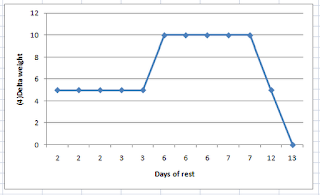 This does NOT mean that rest is not important; remember, John is now operating on the right side of the J curve, with 6 or more “Days of rest”. The last graph above suggests that taking 12 or more “Days of rest” shifted things toward the end of the supercompensation window, in fact placing John almost outside of that window at 13 “Days of rest”. Even so, there was no loss of strength, and thus probably no muscle loss. 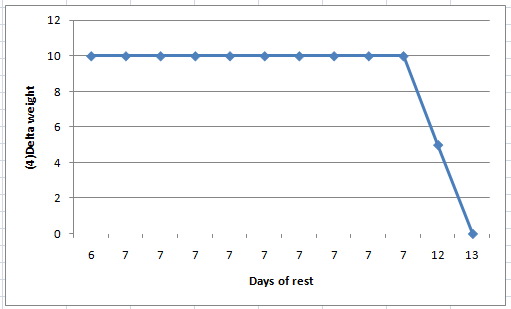 Loss of strength would be suggested by a negative “Delta weight”, which did not occur (the “Delta weight” went down to zero, at 13 “Days of rest”). The two graphs shown side-by-side suggest that 2 “Deadlift sets” seem to work just as well for John as 3 or 4, and that “Deadlift reps” in the 18-24 range also work well for John. In this second trial, John achieved a better gain over a similar time period than in the first trial. That was a 36 percent gain from the baseline “Deadlift weight”, a gain calculated as: (355-260)/260. John started with a lower baseline than in the end of the first trial period, probably due to detraining, but achieved a final “Deadlift weight” that was likely very close to his maximum potential (at the reps used). Because of this, the 36 percent gain in the period is a lot more impressive than it looks, as it happened toward the end of a saturation curve (e.g., the far right end of a logarithmic curve). One important thing to keep in mind is that if an HCE user identifies a nonlinear relationship of the J-curve type by inspecting the graphs like John did, in further analyses the focus should be on the right or left side of the curve by either: splitting the dataset into two, and running a separate analysis for each new dataset; or running a new trial, now sticking with a range of variation on the right or left side of the curve, as John did. The reason is that nonlinear relationships tend to distort the linear coefficients calculated by HCE, hiding a real relationship between two variables. This is a very simplified example. Most serious bodybuilders will measure variations in a number of variables at the same time, for a number of different exercise types and formats, and for longer periods. That is, their “HealthData” sheet in HCE will be a lot more complex. They will also have multiple instances of HCE running on their computer. HCE is a collection of sheets and code that can be copied, and saved with different names. The default is “HCE_1_0.xls” or “HCE_1_0.xlsm”, depending on which version you are using. Each new instance of HCE may contain a different dataset for analysis, stored in the “HealthData” sheet. It is strongly recommended that you keep your data in a separate set of sheets, as a backup. That is, do not store all your data in the “HealthData” sheets in different HCE instances. Also, when you copy your data into the “HealthData” sheet in HCE, copy only the values and formats, and NOT the formulas. If you copy the formulas, you may end up having some problems, as some of the cells in the “HealthData” sheet will not be storing values. I also recommend storing values for other types variables, particularly perception-based variables. Examples of perception-based variables are: “Perceived stress”, “Perceived delayed onset muscle soreness (DOMS)”, and “Perceived non-DOMS pain”. These can be answered on Likert-type scales, such as scales going from 1 (very strongly disagree) to 7 (very strongly agree) in response to self-prepared question-statements like “I feel stressed out” (for “Perceived stress”). If you find that a variable like “Perceived non-DOMS pain” is associated with working out at a particular volume range, that may help you avoid serious injury in the future, as non-DOMS pain is not a very good sign (). You also may find that working out in the volume range that is associated with non-DOMS pain adds nothing in terms of muscle gain. Generally speaking, I think that many people will find out that their sweet spot for muscle gain involves less frequent exercise at lower volumes than they think. Still, each individual is unique; there is no one quite like John. The relationship between “Delta weight” and “Days of rest” varies from person to person based on age; older folks generally require more rest. It also varies based on whether the person is dieting or not; less food intake leads to longer recovery periods. Women will probably see visible lower-body muscle gain, but very little visible upper-body muscle gain (in the absence of steroid use), even as they experience upper-body strength gains. Other variables of interest for both men and women may be body weight, body fat percentage, and perceived muscle tone.